The most aggressive players on the combo-drive markets, LG and Samsung, keep on fighting. Both have recently launched new combo drives. The new-comers got characteristics very close to modern CD-RW drives. The new summit they reached is the CD-R write speed increased up to 48x. Also, they deal with Ultra-Speed CD-RW at 24x. Well, the companies are still very interested in this market sector because Flex, Micro ATX and other Bare-bone computers are getting more and more popular, and such systems do not have space for two or more optical systems. Two disc types are used for the tests - with cyanine and phthalocyanine coating. 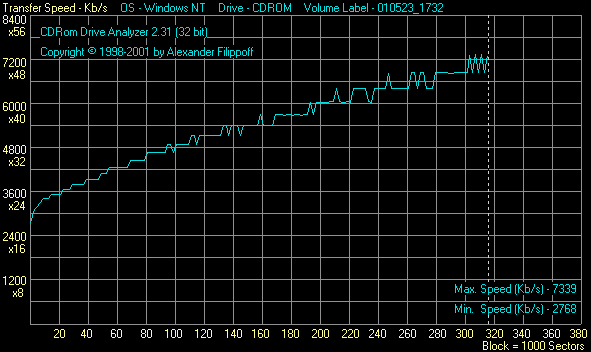 Since all the drives switch to the Z-CLV mode for the maximum write speed, the data are shown in the graphical form. The LG drive copes with cyanine discs better, and the Samsung can't bear them at all. We tried two other cyanine discs from other manufacturers on the Samsung, but it didn't like them either. 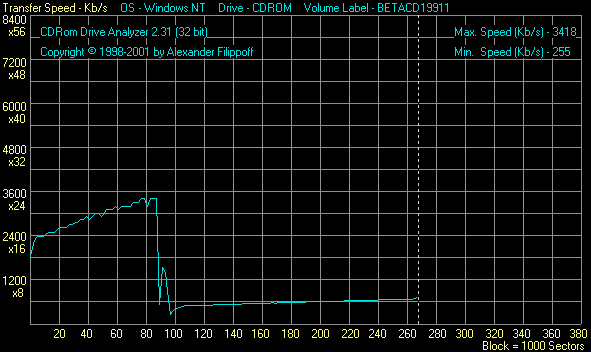 In case of phthalocyanine CD-R discs, the LG's drive performs better again. Although the write speed of the Samsung is a little higher, it took a lot of time for it to cope with Lead-In - Lead-Out. 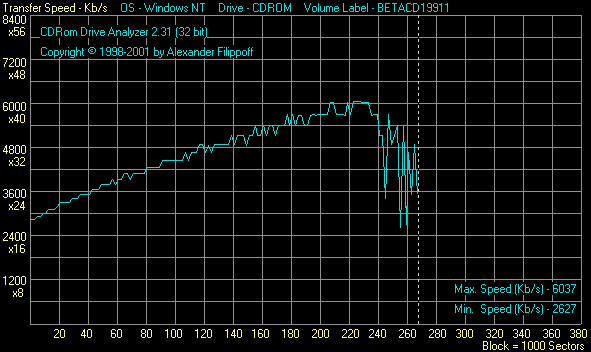 None of the drives managed to reach 48x specified, though the discs are certified for this speed. 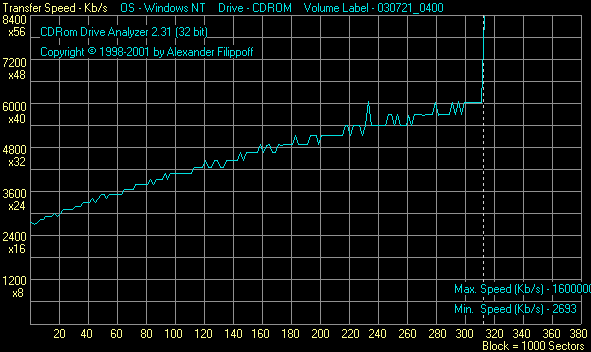 The write speed of 24x is quite significant for optical drives, and data are demonstrated in the graphical form. Although it's not specified that the Z-CLV mode is used in operation with Ultra-Speed CD-RW media, we decided to check it. Although the drives supporting Ultra-Speed CD-RW are growing in number, our local market has still a very modest offer of the respective media. 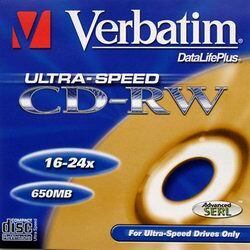 We used the Verbatim disc 650mb in this test. LG's model reaches the maximum speed earlier, and as a result, wins 10 sec at this stage. CD-RW recording in UDF, 530 Mb test packet in 3550 files. The LG seems to be fastest again. Although the UDF formatting time is much lower with Ultra-Speed CD-RW media, the write speed is almost the same. Operation with 80mm CDs (CD-RW disc tested), UDF formatting and recording. 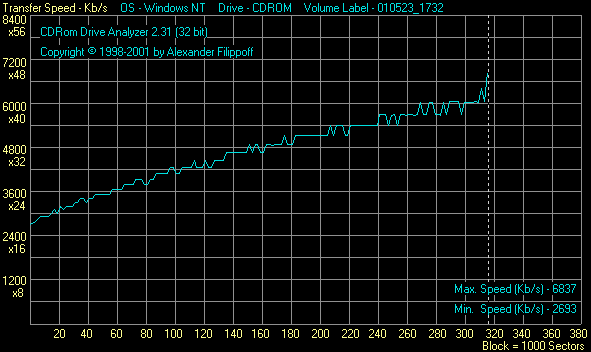 Formatting and recording of 80mm CD-RW disc in UDF. 4x write speed. 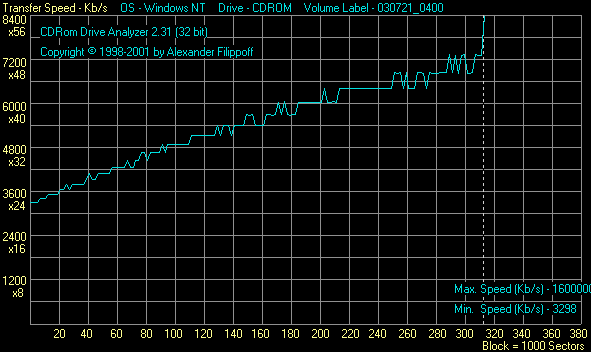 All the drives successfully read and recorded 80mm discs. The tests were carried out with a device described in the this review. Although the write speed set was high, both drives performed well recording the phthalocyanine media specified for a high write speed. Although the results are not ideal, you won't have problems with quality. Recording of the cyanine media looks much worse, but the discs used in the tests were designed for a lower speed (16X). We also recorded cyanine discs specified for 32x on the Samsung, but the outcome was the same. Nevertheless, both drives and discs performed quite well in such a non-standard situation. The LG can burn discs faster, but it makes much more errors in this case. The Samsung demonstrates the best results in this test with all media types. The low scores of the LG in the Winmark can be accounted for by the drive's incompatibility with the test program. The LG lowers its speed and then makes no attempts to lift it again. In all other respects, both drives cope excellently with the low-quality CDs. No uncorrectable were noticed. Relative position (01:05.00): 01:05.40 -> incorrect! Absolute position (01:07.00): 01:07.40 -> incorrect! Relative position (01:33.00): 01:51.40 -> incorrect! Absolute position (33:35.00): 51:53.40 -> incorrect! Relative position (00:00.00): 02:30.40 -> incorrect! Absolute position (70:02.00): 112:02.40 -> incorrect! The Samsung copes with audio track extraction better though not very fast. The detailed information on the parameters tested is given in the help file of the Nero CD Speed test program. All the drives have read the test CD successfully. The LG is the champion. Both drives lowered the read speed. But still, the LG performs better. The Samsung read the second layer of the test DVD not very fast, in contrast to the LG's model. Both drives perfectly read discs of the DVD+R/RW format, but the LG's does it faster. The drives confidently read all DVD types. Besides, we tested Multi-Border DVD-R discs (it's like multi-session CD-R), - the drives have read them and recognized all sessions recorded. DVD-Video playback with Cyberlink PowerDVD 4.0. The DVD-Video was perfectly played by both drives, no artifacts. Both drives make quite a lot of noise at the maximum speed. The Samsung seems to be a little quieter. The LG's model can't reduce the maximum speed even with external programs. The Samsung allows reducing it in 1X steps but it seems that the speed doesn't actually fall down, because audio tracts were captured at the maximum speed after it was reduced on the software level. The LG noticeably heats up, though the Samsung makes a real oven. It can be dangerous to install such drive in a compact poorly ventilated PC case. Besides, I'm not sure that such drive will last long. Both models work pretty well with the unbalanced discs. Although they made a lot of noise and vibrated much at a high speed, they managed to finish reading the discs. 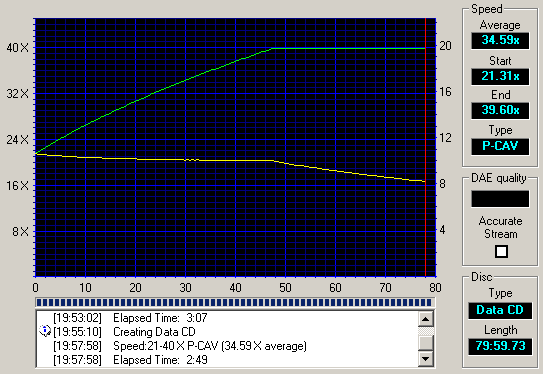 So, today we have tested two fastest and most advanced drives in their class. CD-RW writing at 24x is very impressive, and many will be really excited that it takes almost the same time to record CD-RW as for a CD-R. However, the speed increased lifted the noise produced by the drives, as well as the temperature. Each drive has its own pronounced negative factor - the LG's model is too noisy, while the Samsung is very hot. That is why it's for you to decide which drive to take.